This page will redirect you to our new web site. Please change your bookmarks. This one is out of date but we haven't figured out how to get the new one to show up in a Google search yet. 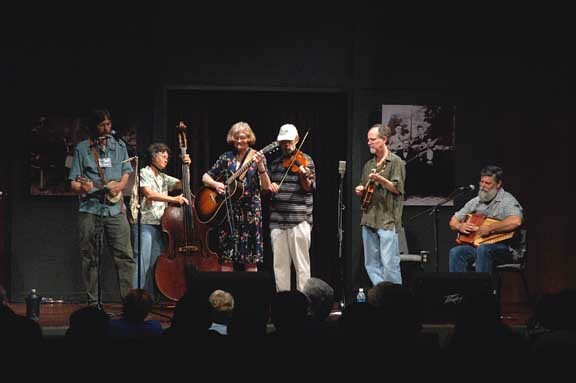 Red Mountain plays good-time, old-time string band music. At festivals and clubs you'll hear them play high-energy dance tunes and old-timey blues, and sing songs from the earliest days of country music, when folks like the Carter Family and the Delmore Brothers were the stars. You're likely to hear a lot of impromptu humor as well. Red Mountain's expertise as a dance band has garnered them invitations to dance festivals across the country. At dances they dip into their large repertoire of powerful contra dance medleys and driving square dance tunes. They learned many of their tunes from older fiddlers in Alabama and Tennessee, and they play in a style that reflects the region in which they live. Folks often describe Red Mountain as a wall of sound. Components of this sound are fiddle by Jim Cauthen, guitar by Joyce Cauthen, mandolin by Phil Foster, harmonica and banjo uke by Jamie Finley, autoharp by Bill Martin and bass by Nancy Jackson. Vocalist Carole Griffin sometimes joins them for concerts and festivals. 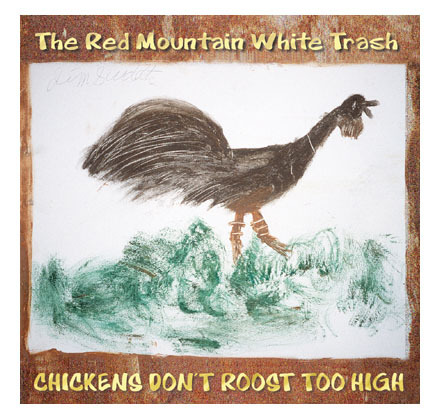 The Red Mountain White Trash’s first CD, Fire in the Dumpster (Whoop it Up Records #101), was released in 1995. To hear selections from this CD courtesy of CD Baby, click here. Their second CD, Chickens Don’t Roost Too High (Whoop it Up Records #102), was rated the best old-time string band recording of 1999 by County Sales. To hear selections from this CD courtesy of CD Baby, click here..
All three CDs are reviewed in the All Music Guide. "The group sprang up organically at neighborhood get-togethers, much like the Squirrel Nut Zippers, then went on to release an album called Fire in the Dumpster. 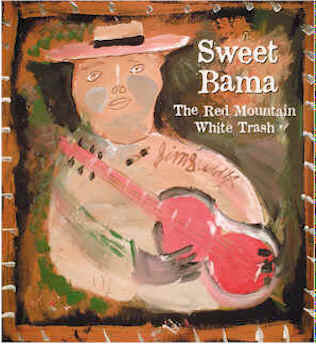 Red Mountain White Trash has a playful sense of humor, lots of talent and a brand-new CD on its resume.—Mary Colurso, The Birmingham News, Dec. 1999. "They put a grin on your face, even when you’re not dancing, so I can only imagine the beaming faces at one of their dances." –Kerry Blech, Victory Music Review, January 1999. "I’m going to start this review in top gear by saying that I haven’t been so excited by a new release by living musicians since…a friend asked me to listen to this new record by a group called The Highwoods String Band. It’s sorta deju vu, all over again…This is a big, powerful group that puts out a wonderful, somewhat unconventional sound that has been described as a "wall of sound." The analogy falls short; this music is more than a two-dimensional wall. It is a moving, rocking, sometimes undulating, sometimes sentimental sound that rarely falls short of excellent. ""-Review of Chickens Don'’ Roost Too High by Bob Woodcock in The Old-Time Herald, Summer 1999. "Your show (WorkPlay, Jan. 17, '04): A wonderful and varied collections of tunes performed by good friends who love the music and who play with great skill and a genuine sense of humor and affection for the people in the audience. I left with a great big smile on my face." --Duncan Blair, friend and fellow musician. We just received the three cd's today and boy was it worth it. I have been playing them in the office and got a bit of a dance going. They are just wonderful examples of "Old-Time String Band" music. Our show "Southern Style" will be playing them to a very large appreciative Melbourne audience over the coming weeks. We here are thrilled to say a big Aussie welcome to "The Red Mountain White Trash" and "Flying Jenny." Merle Watson Festival 2001; Cultural Center Theater, Charleston, WV; Folklore Society of Greater Washington, D.C.; City Stages Festival, Birmingham, AL; Augusta Heritage Center Performing Arts Center, Elkins, WV; Jubilee Community Arts at Laurel Theater, Knoxville, TN; New Mexico Friends of Folk Music and Dance, Albuquerque and Santa Fe, NM; Live on Radio Station KUT, Austin, TX; Cactus Cafe, U of Texas Campus; Kentuck Festival of the Arts in Northport, AL; Birmingham Jam Music Festival; Williams Station Days in Atmore, AL; Five Points Music Hall, Birmingham, AL; Baylee's, Blacksburg, VA; Pepper Place Farmers' Market; Black Mt. Festival; Savannah Folklore Society, Mountain Laurel Autoharp Festival, PA; Freight and Salvage, Berkeley, CA; City College of San Francisco; The Mainstay, Rock Hall, Maryland; Live Oak Music Festival in Santa Ynez Mountains, CA; Antigua, Guatemala for the Partners of the Americas, Riverfolk Festival, Manchester, MI; Minnesota Bluegrass and Old-time Music Festival, Magic City Arts Connection, Birmingham; Bear on the Square, Dahlonega, GA.
Augusta Heritage Center Dance Week, Elkins, WV; Florida Rhapsody Dance Week in De Leon Springs, FL; Merle Watson Festival 2001; Fiddlehead Spring Dance Weekend in Black Mt., NC; Chattahoochee Country Dance Society Dance Weekend, Atlanta, GA; Birmigham Country Dance Society's Old-Time Music and Dance Weekend, Mentone, AL; Fiddlehead Spring Dance Weekend in Black Mt., NC; Merle Watson Festival 2001; Nashville Country Dance Weekend; Black Mt. Festival; Endless Summer Dance Weekend in Tallahassee, FL; Palmetto Bug Stomp Dance Weekend in Charleston, SC; Fire Ant Frolic, Austin, TX. ; Appalachian String Band Contest Saturday Night Dance in Clifftop, WV; Glen Echo Park Ballroom, D.C.; City Stages Festival, Birmingham, AL; Savannah Folklore Society; New Mexico Friends of Folk Music and Dance, Albuquerque and Santa Fe, NM; Glenside Memorial Hall, Philadelphia, PA; The Grange, Greensboro, NC; Kanawha Valley Footmad dance, Charleston, WV, Work/Play, Birmingham (where photo below was taken), Alta Sierra Labor Day Dance Weekend, CA; San Francisco Saturday night dance; Sierra Madre, CA, Saturday Night Dance, Santa Barbara Sunday Night Dance; AACTMAD, Ann Arbor, MI; Chicago Barn Dance, Madison, WI, Tuesday Night Dance. April 12: Birmingham Public Library, morning performances at The Big Read event celebrating "To Kill a Mockingbird." Call (205) 226-3600 for info. Friday April 25: Appearances in Calhoun, GA schools in connection with Gordon County String Band Festival. Friday, October 17, 2008: Concert at Local Color in Springville, AL. Come for dinner and enjoy two sets by RMWT starting at 7:30. Cover charge: $5. October 24-26, 2008: Dance Weekend at John C. Campbell Folk School, Brasstown. October 31-November 2, 2008: Solefest, a dance weekend in Springfield, Mo. with Frederick Park, caller. Red Mountain took the Bronze at the Mentona 500 (August 05) but had to concede the trophy after judges viewed tapes of the race and determined that they had not actually run the course.